At 9:30, we boarded the bus to Ljubljana. It was a bright, sunny day and the ride was most enjoyable. There were lots of young people and tourists on the bus going to Ljubljana for the day. As we reached the outskirts of the city, we were struck by the huge number of cement block apartment buildings, a carry-over from the communist era. Ljubljana is the capital, the heart of the political, economic, cultural, educational and scientific life of Slovenia. With about 300,000 inhabitants it is a small city, but a great city! We proceeded to Hotel Slon, recommended by both Chloe and Rok. It's about a 10 minute walk from the bus station (which is directly across from the train station) and is located perfectly - right in the center of the city. It's an excellent 3-star facility - has a popular Italian restaurant which we did not try as we were to be in Italy the following week. Our room was quite nice and perfectly quiet, (despite the fact that it faced onto the main street - Slovenska Cesta), thanks to the double windows. There were nice hardwood floors, and wood-trim all around that matched the wooden furniture. There was a queen-size bed with a fluffy duvet and good pillows. The modern bathroom had a good stall shower and everything was very clean. With CNN on the T.V., we were happy campers. Across the Ljubljana River, behind the hotel, is the old city. There are three tourist trails which guide visitors from one point of interest to another. The trails, of differing lengths, are color-coded. Having familiarized ourselves with the layout of the city prior to our arrival, we had already prepared our own basic route plan. Alongside the Hotel Slon is a pedestrian street that leads to Presernov Trg. where it all starts - and it is gorgeous. The square is named after Slovene poet France Preseren and there is a monument to him in the center with steps at the bottom providing a place to meet, sit and look at the beauty around you - The Franciscan Church with its ornamented facade and magnificent interior - the art nouveau facades of the Ura and Centromerkur buildings - the Tromostovje (triple bridge): the old stone bridge from 1842 called Spital Bridge, and two more with which architect Joze Plecnik (responsible for much of the most beautiful architecture in the country) spanned the river in 1831, together opening an entrance into the old town. Turning left after crossing the bridge, one discovers a bustling marketplace. Along the river in Plecnik's famous market, a long, monumental building with colonnades with food shops selling mouth-watering breads, pastries, cheeses, meats - heavenly scents all! Outdoors are produce and flower vendors offering everything that grows. We've all been to markets, but this one seemed very special indeed. We crossed back to the city center, marveling at the beautiful vistas up and down the river and along its banks, at the southern end of the old town and began our stroll through the newer part of town. Usually, once you visit the old town of a city you have seen the best of the city - not so here! Magnificent public buildings and squares, interesting and clean streets. The Mayor of the city, Dr. Dmitrij Rupel sums it up best in his letter in the City Guide - "You should stroll along the city streets, breathe the Ljubljana air, look up towards the rooftops and castle trees, admire the ancient portals and stucco work, visit the Baroque cathedral, smell the sweet fragrances and rejoice in the luxuriant colors of flowers and greenery at the Central Market. Lean from one of the bridges for a moment to admire the dark green, mysterious Ljubljana, which originated underground. Capture in your heart the sound and rhythm of the city. In our language, the name of our capital is associated with love. You won't easily forget Ljubljana". On this Saturday the streets were filled with people of all ages - shopping, strolling, sitting, relaxing - enjoying the beautiful weather and their city. Shops close at 13:00 on Saturdays, yet at 17:30 the streets were still full. This is a city with a real pulse. Everybody is well-dressed and groomed. The city is prosperous and growing, with the people enjoying the availability of everything they require and willing to work hard to acquire it. Hotels are being renovated, buildings repaired and improved. This society has made enormous progress in so short a time. Linda spotted a well-dressed couple exiting a courtyard near the Opera House and decided they must be leaving a restaurant, so we went to investigate. Sure enough, tucked in the courtyard and down a flight of stairs is Operna Klet. It is on Zupanckeva 2 - look for a fish symbol and the name on the front wall. It is a superb seafood restaurant. We made reservations for an early dinner. The place is a real charmer if you like arched brick ceilings, individual rooms, wood and stucco walls and the smell of fresh fish as you enter via the kitchen area. A sweet, smiling, mature waitress greeted us and gave us our choice of tables. She did not speak English but the menu was in English and by now we were beginning to speak menu Slovenian. We ordered our mineral water and red wine and next to arrive was a platter of fresh fish from which to choose. The only reason for the menu is to match the fish to the price. Linda chose fried calamari and I selected a local mild white fish from the Adriatic called zobatec. We both started with a lovely fish soup. We have been disappointed so many times with fried calamari which often is either greasy, chewy, tasteless, mushy or a combination thereof but this version was absolutely perfect. Lightly crusted and crisp outside, sweet and tender inside - the light batter and the calamari combined to present a wonderful blending of delicious flavors - the portion ample for at least two! We turned-in early after a long day and arose early to catch the train to Maribor and the bus to Radenci, our next destination. Fortified with an excellent buffet breakfast served in a formal dining room, we boarded the train right on schedule for the first leg of the trip. Maribor is located northeast of Ljubljana and is the second largest city in Slovenia. In Maribor, we transferred to the bus to Radenci, which is a thermal bath and mineral water town. The eastern part of the country, north and south, has many thermal bath resort towns. The train was as nice as most in the rest of Europe. Our second class car had six passenger compartments - roomy, clean and comfortable. The day dawned foggy but cleared as we traveled through beautiful countryside with rivers, forests, mountains and well-kept farms. This train ride is the well-promoted Scenic Railway Historical Train. We arrived on time at 11:40 (984 SIT) and walked the 100 yards to the lovely, modern bus station where we boarded the 11:55 bus to Radenci which drove through wonderful farms and vineyards and arrived right on schedule at at 12:45 (530 SIT). Radenci is 5 km. from the Austrian border and the town of Bad Radkersburg where Linda and I were introduced to the thermal bath experience a couple of years ago. It was a ten minute walk to the thermal spa complex where three hotels, the 4-star Radin, the 3-star Miral and the 2-star Terapija share a central reception area. There is a beautiful park adjoining the complex which is ideal for walking, jogging or just relaxing. The lobby is large and inviting with a coffee and pastry bar to the front and a huge corridor leading to the spa facilities straight ahead. To the left, a mineral water bar provides complimentary Radenska water at various times during the day. All the typical spa facilities are available for health and beauty - the thermal pool complex has been enlarged recently and is amazing with outdoor and indoor pools of varying temperatures and mineral composition, whirlpools, jet sprays, and a huge exercise swimming pool to complement the thermal bathing experience. There are lounging areas indoors and out for breaks between taking the waters. The pool complex is available to guests at no additional charge and non-guests can use the facilities for reasonable fees. The locker room, shower and bathroom facilities are large and comfortable and there is a very well-equipped exercise room available to guests at no charge. The health and beauty treatments are by appointment at additional cost. In all, it is a first class facility at a very reasonable price. We chose to stay half board at the Radin. The rooms are very nice - good size with balcony and excellent furnishings and decor and lots of closet and shelf space. The twin beds are pushed together and have thick, firm padded mattresses, comfy duvets and great pillows. The bathrooms are modern with all the amenities. The front desk personnel were extremely helpful and courteous. We were probably the only English speaking patrons and the place was fully booked. Thermal bathing hasn't caught on with North Americans as it has for Europeans. Most visitors here are Slovenian, Croatian, Italian, German, Austrian and Hungarian. We were very fortunate that we were able to meet Rok and his family who had come to spend the week-end. After getting settled, we headed for the pool area and spent several hours soaking, relaxing and swapping smiles with our fellow-bathers. There were the middle-age and older folks there for the health benefits as well as young families enjoying the facility for good, healthy family fun. On the way back to our room, we stopped and enjoyed the mineral water, which really hit the spot after being in the outdoor sun and the warm water. Dinner is served from 18:30-20:30 in a huge dining room just begging for renovation. It is comfortable, however, and we are told that redecorating is being planned. There is a huge salad buffet, nightly, from which one can easily create an entire meal. Indecisive people might run into big trouble at the salad dressing presentation. Every kind of dressing combination is available along with olive, nut and seed oils and many varieties of vinegar. Some of the local favorite offerings from above are the marinated sauerkraut, sauerkraut with boiled potatoes, garlic and olive oil dressing, yogurt-based dressings and pumpkin seed oil (quite good). Decisions - decisions - decisions - - leave some room for the real food! There's also a nice variety of breads and rolls on another self-serve table. There were always two soups, a meat or fish entree and a few desserts from which to choose. The service and food tend to be a bit institutional due to the large number of people being served, however the overall quality, quantity and presentation are more than adequate for the price. This first night, we both chose tomato soup, which was poor. Linda had pot roast in a liver and wine sauce and some kind of mystery stuffing. My choice was a small, whole fish lightly battered and pan fried and served with Brussels sprouts and potato coated with breadcrumbs and baked. We both had ice cream for dessert. Wine was extra, but inexpensive. The fish was the better choice. In total, it was a fairly decent meal. After dinner, we met Rok in the cocktail lounge and over an outstanding bottle of chilled white Slovenian wine, Rok took us through the recent history of the country from independence to the present. Thank you again, Rok, the background you gave us enabled us to put many things into perspective as we traveled through your country. The buffet breakfast (we did manage to sleep between meals) was superb. This is a country that knows how to do breakfast. Rok introduced us to the marketing manager, Mirko Eaeinovie, and his associates, Milan Grah and Eric. Milan and Eric offered to take us on tours of the surrounding area. Milan would take us today and Eric, tomorrow. These half day tours are available to all guests of the hotel. These young men are bright, well-educated, personable, industrious, love their country and are working hard to build their futures. It was a pleasure being with them. Not only did we learn about the area but their perspectives of the country, its problems, its opportunities and its future. Thank you Milan and Eric, you are a credit to your employer and to your country. Off we went with Milan to Murska Sobota, not far from the Hungarian border. It is a gateway to and from Eastern Europe. Of the population of 14,000, 2 to 3 thousand are of Hungarian descent. There is also a large, well-integrated Gypsy population. We visited the old Sobota Castle, a Catholic church and one of the two Evangelical churches in the country (the other being in Ljubljana). We also visited a so-called Jewish cemetery - a few tombstones in a kind of memorial parkette. This is the largest agricultural area in the country which is also famous for the manufacture of quality garments which are sold with famous designer labels throughout the world. We drove through villages that do embroidery, a cottage industry, and each village does its own particular designs. In Bogojina we visited the White Church which was designed by Plecnik. It has the round steeples for which he was famous and is white stucco inside and out. There is a dramatic ceramic-decorated ceiling, a gorgeous ceramic floor and an imposing alter of wooden beams supported by ceramic pillars. Our next stop was Loncarstvo and the home/workplace of Mr. & Mrs. Bojnec who make beautiful ceramic pieces by hand. We were served slivovitz while we watched the artisans at work. They were warm, sweet people who loved posing for photographs. From there, we paid a quick visit to Moravske Toplice, another major thermal resort complex which appears to be in the same category as Radenci. The town of Martjanci is famous for the church of St. Nicholas which houses the oldest frescoes in Slovenia and for its multitude of stork nests! Our huge breakfast was beginning to wear-off and it was time for an early afternoon snack. In the town of Polana, Milan took us to Horvat Lovenjik to have the Preknurska gibanica. This local version of gibanica, Slovenia's most famous pastry, is justly famous (and available) throughout the country. But here it was THE BEST, with a flaky crust filled with apples, berries, raisins, poppy seeds and cheese. Together with the cappuccino, this was a heavenly experience. The owner of the establishment came by to chat and invited us to sign his guest book. The food being served around us looked fabulous. Some day we will return to this charming spot with its genial host and great food. Milan was well-informed about the sights he showed us and offered insights about life in Slovenia which added to what we had learned from Rok. We returned to the hotel in time to join a group on a walking tour to the Radenska bottling plant. There was no English spoken but we got the gist of how the waters are pumped in, processed and bottled. They also have the license for bottling and canning Pepsi's products plus they do many of their own carbonated and fruit drinks. We enjoyed the tour and the free samples! Tomorrow Eric would continue our education, but for now there was still enough time for some soaking before dinner. The salad buffet had a few new offerings at dinner and the rest of the meal was quite good. We both opted for the same menu: herb cream soup, pork Cordon Bleu with French fries and sesame-topped broccoli, and ice cream for dessert. As this was our third and last day at Radenci, after breakfast we decided to treat ourselves to carbon dioxide mineral baths. The double-size tub was already booked so we reserved two individual cubicles, each containing a large, stainless steel tub which gets filled with the warm, bubbly water in which you relax for 20 minutes followed by a 10 minute rest on a cot in the adjoining private room. It was all very relaxing and is said to be invigorating - but since we already felt great, it was hard to quantify the degree. Dressed and ready, we enjoyed a cappuccino before departing on our tour with Eric. Our first stop was at the last mill on the Mura River. Here a father and daughter grind the wheat and grains for the local farmers. The mill is the last of the type that is driven by the flow of the river - new electric powered mills have replaced this old method. Next, we drove to Jeruzalem. This is wine-country - delicious, sweet-smelling hilly vineyards. Eric stopped at Vnikat- Vinotoc Belec, Zelezne Dveri 9 to introduce us to Marjan and Francka Belec where we sampled their delicious white wines (Riesling and Chardonnet) and admired Marjan's hand-painted ceramic souvenirs. 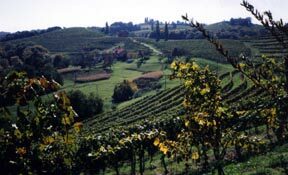 We drove to the highest point of Jeruzalem from which we could see both the Austrian and Hungarian borders - a magnificent view of the rolling hills and vineyards as far as the eye could see. It was a serene and peaceful spot with the church of Jeruzalem dominating the peak. Leaving the wine country of Jeruzalem we next entered the wine country of Radenci - just as delightful - and from its highest peak we could see the thermal spa town of Bad Radkersburg, Austria in the distance. We stopped for a snack at Jansev Hram, a well-preserved farmhouse owned by the hotel with a small wine museum plus a dining room for groups. The Prleska gibanica we had today, was a much flatter version with a similar filling which was good but no match for yesterday's Preknurska gibanica, our very favorite. Back in time for a good, long last session in the pools which gave me time to reflect on our stay in Slovenia - from lakes and mountains to an active capital city to a thermal bath spa surrounded by beautiful countryside, villages, vineyards, farms with influences of its cross-border neighbors everywhere in the culture. I could hardly wait to see what awaited us in the next two cities on our Slovenian itinerary. The last dinner, like the others, was good but not memorable. We did have a new and delicious corn bread but the mushroom soup Linda had was just fair although my grilled sardine appetizer was quite nice. Linda loves meat loaf but I think she would have been happier if it didn't contain raisins - but the mashed potatoes were okay. My beef goulash was fine and the polenta was outstanding. More ice cream - but tonight with real whipped cream.